I am a minister. I am called to live as a minister, but I am also a teacher. As a college chaplain, I work with people through crises, plan worship services, support a variety of spiritual life activities and also teach religion courses each semester. Yes, I am a busy person. And I love my job. When teaching about religion, each semester one phrase comes out of my mouth on multiple occasions. 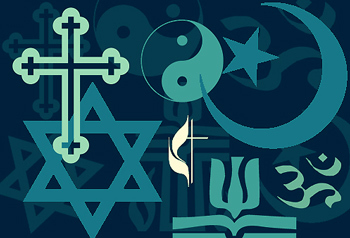 “Every religion has a great deal of diversity.” I tend to focus on women’s studies and religion, and we explore how different religions treat women and allow them to function within that particular faith. It is impossible to say that any particular religion has one attitude towards women. It depends on culture, geographical location, age, race, social status, and so many other things. Just ask any Buddhist feminist. People assume that Buddhism is all about peace and equality, but there are Buddhist women in some parts of the world who have not found that to be case. Does that mean that all Buddhists are patriarchal misogynists? Certainly not. I have been called on to defend my faith on occasion. “How can you be part of a religion that thinks God is a man?” I always respond that even though there are some sects of Christianity who believe this, the majority of Christians believe God is above gender. “How can you be part of a religion that has oppressed people throughout the centuries?” Yes, there are some awful things that have been done in the name of Christianity (the Crusades and genocide of Native Americans come to mind immediately), but there are many Christians who do not believe their faith is inherently violent or encourages violence. “Blessed are the peacemakers, for they will be called children of God” is one of my favorite phrases (Matthew 5:9). Despite these occasions, I live in a country where the majority of individuals are Christians, and “defending one’s faith” is not a commonplace occurrence for me. Most people understand my job and role in life, and fortunately for me, most people tend to think well of ministers (despite some high profile cases that could make one think otherwise). I wish people of other faiths were given the same benefit of a doubt. I have worked with the Interfaith community for many years, especially since 9/11. Since that time, I have witnessed countless Muslims defend their faith. This issue has increased in recent weeks, with the rise of ISIS, an organization which obviously does not understand the fundamentals of Islam. How many times do Islamic scholars and leaders have to speak out to ears that refuse to listen? How many times do they have to defend their faith? One of the things I like best about Jesus (who is considered a great prophet in Islam) is that cultural and religious boundaries didn’t bother him. He saw the light of God in others, no matter how different from himself they might be. He reached out in love, extending the hand of community and understanding. How much better would this world be if people cared more about looking for the light of God in others, and reaching out with respect, than they did about defending their own understandings or fighting for attention and ratings? Let’s stop calling on people to defend their faith. Let’s instead try to live in community, building bridges which help us learn about other faiths. I know the more I do that, the more my own personal faith deepens.